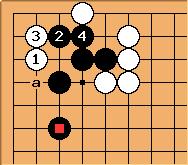 For example here, played as an early endgame play, is a small monkey jump. It is more frequent in pro play in this particular corner formation than the ordinary monkey jump to a.
Theorists have worked on comparisons of the small monkey jump and monkey jump from the point of view of exact counting. In what could be termed typical positions, the small monkey jump doesn't gain an advantage in points. Nevertheless it is played often in pro games, for reasons particular to the context. 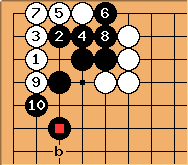 In this case might not be sente: the cut at c is usually worth a little more than five points (deiri), so that Black may not protect. Here if Black doesn't answer (at ), is a big endgame play. If Black has a nearby stone on the left side (which is likely to be the case, since it is supposed to be black territory) this will take the corner. If is impossible, Black can just block at a, and White will have to accept gote.